One place to find that support has been the American Legion Auxiliary (ALA), the world’s largest women’s patriotic service organization. The organization recently received a grant from the Elizabeth Dole Foundation’s Hidden Heroes Campaign for innovative and evidence-based programs that address the long-term needs of military caregivers, spouses, parents and loved ones caring for servicemembers and veterans at home. “The ALA recognizes that many veterans depend daily on their dedicated caregivers,” said Kathy Dungan, national president of the organization. “We recognize how important it is to support caregivers and address the unique stresses they face to help ensure our nation’s heroes are supported for years to come." 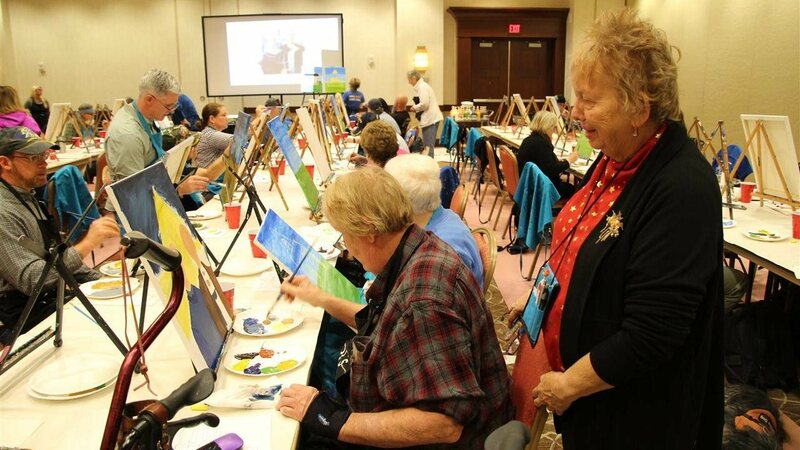 At the National Veterans Creative Arts Festival (NVCAF) last fall, the grant helped the Auxiliary provide several opportunities to empower caregivers and provide social support. Respite bags were handed out to each caregiver at registration. Although the event is centered around veterans, the bags and warm welcomes from Auxiliary volunteers and staff made the caregivers feel special. Programs relevant to the needs of military caregivers are typically focused on the servicemember or veteran, and only incidentally related to the caregiver’s role. There are gaps in needed programs, which the grant helped to address. In addition, the funding provided the opportunity to build skills and confidence as caregivers. According to a Rand Corp. study, there are more than 5.5 million military and veteran caregivers in the U.S. They spend many hours tending to the visible and invisible injuries or illnesses of their loved ones. In the study, 17 percent of civilian caregivers reported spending more than 40 hours per week providing care; 12 percent of post-9/11 military caregivers and 10 percent of pre-9/11 military caregivers spent more than 40 hours per week. To learn more about how to get involved in the ongoing work of supporting caregivers and to give back to veterans, the military and their families, visit www.ALAforVeterans.org.